Mold often occurs in visible areas and on the objects you care for. Areas prone to mold occurrence are the bathrooms, kitchens and basements – where the humidity is higher. Before storing books or putting them in the library, make sure they are completely dry. Put blotting paper or paper towels between the pages, then put them one above the other. They must be pressed in order to remove all the moisture. After 30 to 40 minutes, change the blotting paper between the pages with a new one; repeat this step 2 to 3 times until they are completely dry. Also, you can place the books upright (in order to separate the pages) and dry them with a hair dryer. Keep it at a distance of 15 to 20 cm from the book pages (to avoid wrinkling them). To prevent deformation, put some pressure on the books, placing bricks above them. 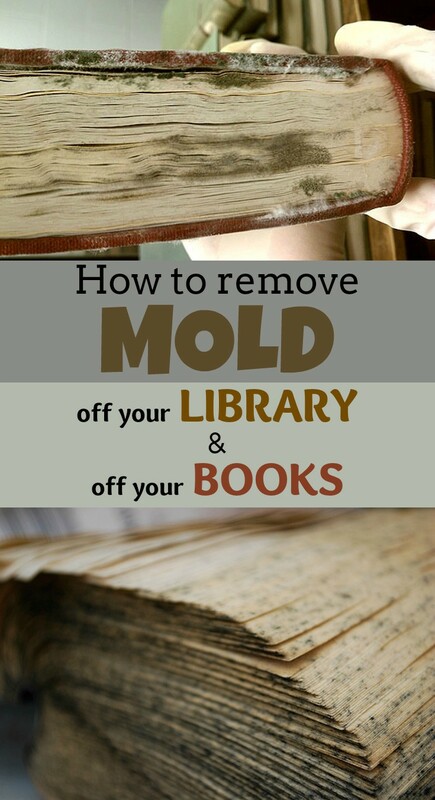 After the book has dried, clean it from dust and mold. Soak a cloth (preferably one that doesn’t leave lint) in hydrogen peroxide or denatured alcohol and clean the book. Then, use paper towels and dry it completely. For mildew stains you can use hydrogen peroxide or diluted lemon juice. After cleaning, make sure that no trace of moisture remains on the books. Use gloves and protective mask in order to prevent breathing problems caused by cleaning solutions and mold. Use a mild alkaline solution such as cleaning soda or trisodium phosphate; you can use disinfectants, too. Apply the solution and rub the shelves using a brush. Rinse the wooden area with clean water and place paper towels over to absorb the moisture. Tip: In order to prevent mildew, place a small container with baking soda between the books; it will absorb the moisture.